Objectives: It has been reported that laparoscopic exploration shows multiple hernia defects that were not detected on physical examination. The objective of this study was to describe the superiority of laparoscopic approach in detecting occult hernia defects and the precise size of hernia defects. Methods: A total of 35 consecutive patients who underwent laparoscopic ventral hernia repair in our hospital between April 2002 and August 2008 were enrolled in this study. The numbers and the size of ventral hernia found on preoperative physical examination and computed tomography were compared to those detected after adhesiolysis during laparoscopic procedures. Surgical technique: The initial port was inserted at the left upper abdomen by minilaparotomy followed by the insertion of two trocars at the left lateral abdomen. After the anesthesia was induced, the size of the hernia defect was measured laparoscopicaly after the adhesiolysis. Composix E/X or Dual mesh was fashioned so that the defect was overlapped in all dimensions by 3-5 cm. The mesh was fixed intracorporealy on the anterior abdomen by O nonabsorbable monofilament suture materials and tucks. Results: The patients consisted of 7 men and 28 women with a mean age of 71.4 years. There were 30 midline incisional, 3 right lower quadrant and 2 umbilical hernias. There were no intraoperative complications and no mortality. Conversion to an open repair was required in one patient because of massive adhesion into the hernia sac. Mean operation time and the length of hospital stay was 124 min and 7.1 days, respectively. 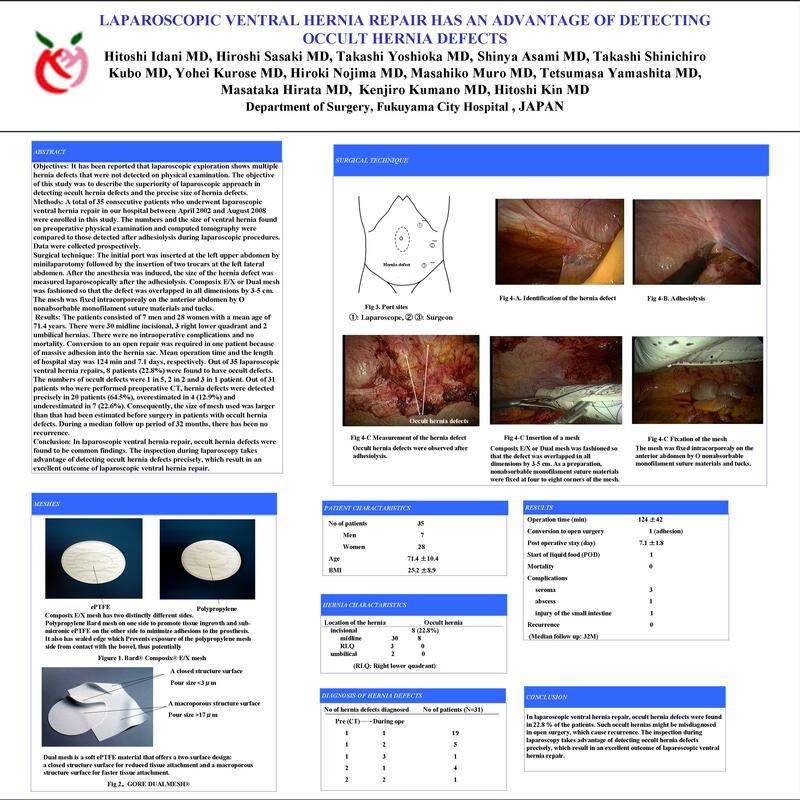 Out of 35 laparoscopic ventral hernia repairs, 8 patients (22.8%) were found to have occult defects. The numbers of occult defects were 2 in 5, 3 in 2 and 4 in 1 patient. Out of 31 patients who were performed preoperative CT, hernia defects were detected precisely in 20 patients (64.5%), overestimated in 4 (12.9%) and underestimated in 7 (22.6%). Consequently, the size of mesh used was larger than that had been estimated before surgery in patients with occult hernia defects. During a median follow up period of 32 months, there has been no recurrence. Conclusion: In laparoscopic ventral hernia repair, occult hernia defects were found to be common findings. The inspection during laparoscopy takes advantage of detecting occult hernia defects precisely, which result in an excellent outcome of laparoscopic ventral hernia repair.